It ought to be as cheap and dismissable as “Stomp”. 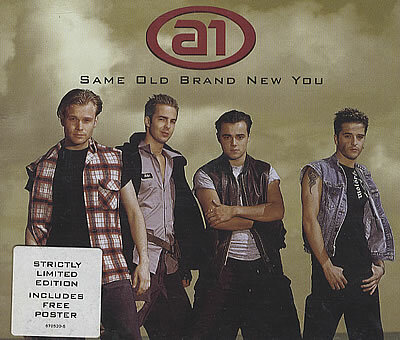 But somehow it’s not – “Same Old Brand New You” is a minor gem, a song that never fails to sweep me up with it, and the best boyband track since Five’s “Keep On Movin’” at least. It’s not an especially complex song – it has no hidden twists or musical surprises. It does have a big, satisfying faux-Max chorus that it builds itself around very effectively – everything in the track teasing and cranking up towards the dramatic “gone, gone, gone” refrain that ignites the chorus hook. And it’s a boyband performance that makes excellent use of its modest resources. The autocue vocal readings that spoiled “Take On Me” are replaced with a song that splits and rejoins its four slightly wheedling voices with real panache: the nervy defiance of the “same old line / one more time” sections, for instance. That doesn’t fully explain why this works, though. Compare America’s boybands, and their real-Max uses of the bombastic, percussive-chord style: “Larger Than Life”, “Everybody (Backstreet’s Back)”, “It’s Gonna Be Me”. They’re all about self-assertion, the Cheiron style as a young man’s confident swagger. Those boys do get vulnerable, of course, but they do it ballad style. A1’s song is different. The boys are on the losing side in this relationship, confused and left reeling by a woman’s caprices. “If you don’t wanna find me gone, gone, gone, gone, gone!” they sing, but the way their voices corkscrew around the word, spiralling down into the chorus, you know there’s no hope of them making good on that threat, of escaping the torment. A1 succeed, in other words, not because they’re trying to be Swedish, but because they’re trying to be Britney – the abject, melodramatic Britney of “You Drive Me (Crazy)”. It’s a good look for them. An idea presents itself: British boybands often spark most to life when they have to act like losers – when their borrowed moves and practiced lines won’t be enough, and desperation pokes its way through. Westlife – who never expose themselves like this, even when their songs offer a chance of it – often remind me of the 1950s and 1960s in the worst way. But there’s something about “Same Old” that recalls Joe Meek and the wounded urgency of his productions for the Honeycombs and John Leyton. For all its counterfeit modern finery, “Same Old Brand New You” lives by the same thing groups like A1 have lived or died by since the sixties at least: the unselfish conviction they can bring to their lies, pleas and promises when cornered. I’m so pleased to read a positive review for this, and I think you’re correct in identifying the hidden strength of this record. Ballad or uptempo, the workmanlike nature of Westlife songs has a curious emptiness at its heart, their smooth professionalism never allowing a hint of real humanity to break through. Same Old Brand New You could be fairly described as workmanlike in the sense that it’s not reinventing any wheels, and it’s very much a budget-take on the American pop sounds of the previous couple of years (the actual American A-listers were already starting to move away from this sound, there’s an interesting lag effect that comes into play that reminds of the way European disco hits by the likes of Kelly Marie and Ottawan hit the charts a good while after the movement had largely burned out in the states). But what makes this song work for me – and endears me to A1 generally – is how committed they sound. The voices are thin, the beats are recycled, but they’re selling this essentially B-grade (at best) slice of pop like it’s …Baby One More Time, and it really does elevate the whole track as a result. You can see it in the video too – the dancing is jerky and faintly amateurish, but they’re trying *really hard*. I don’t want this review to sound like I’m putting SOBNY into the camp of ‘so bad it’s good’ – far from it. Rather, I think A1 take fairly average source material and makes as much as it possibly can out of it, compared to Westlife (again) who frequently took decent material and squandered it by applying the bare minimum of effort and imagination. With all that being said, this was a lucky number one – it tumbled to #8 the following week and was gone from the top 20 two weeks later. But I have an affection for unlikely chart toppers like this, especially ones that are so whole-hearted. We won’t be seeing it here unfortunately, but can also we have some appreciation for A1’s last major hit ‘Caught In The Middle’? Boybands ‘going serious’ is almost always a recipe for disaster, especially groups as frothy as this. But they really managed to pull it off with that track. I almost think having their name attached to it held it back a tad, I suspect it’d be far more highly regarded if a more “credible” act had released it. The album that “Caught In The Middle” came from was pretty solid too. They seemed to be making the transition from boyband to manband quite well and it was a shame it all suddenly came to an end. A1 offer up more ideas in a few moments of SOBNY, than The ‘Loife can manage in a brace of studio albums. Yeah, they’re borrowed ideas, but that hardly matters. I sorta liked their take on “Take On Me” and this is better. They studied the structure of Britney and Backstreet, and decided that was the way to go. And they’re likeable, rough-around-the-edges Popportunists (is that a word? I’m claiming it anyway). And the hook, that bouncy hook that makes the sung title and especially the “gone, gone, gone, gone, gone” so…memorable. Tom draws a line right back to Meek-era pop, and rightly so. The wounded unlucky lover trope is oddly reminiscent of “Runaway” and the robotic coda is a direct contrast to Meek’s shrill proto-electronica. But my favourite bit is the gentle sorrow of the 1st verse leading us by the hand into I-Can’t-Believe-It’s-Not-Max-Martin territory. Is this a ballad? No, sir it’s a BANGER! Similar to “It’s Alright”, thanks to the 3 Network’s Muppet advert for reminding me. Oh, and they get wet in the video. So that’s a big boyband tick right there! Despite all these positives, there is something slightly shoddy about it… plus these boys’ vocals come across as a tad weedy, which means I can’t really go higher than a 7. First job is to consider Same Old Brand New You which I’ve just listened to on youtube for the first time in ages and is far better than I remembered it. I suppose it didn’t help that it was an inconsequential number one, getting there on a low sale and collapsing to number 8, the biggest drop for a no 1 since Fool Again did the same – ironically in a parrallel universe where all else was the same except no SOBNY My Love would have dropped 1-8, albeit after a two week run. A1 broke their chart topping streak at a relatively modest 6 with their next single no more then, as #3 says, we need to consider Caught In The Middle which was unlucky to miss the top in early 2002; held off by a four week bunny I always hated which eventually gave way to a rare uptempo Westlife bunny which is far inferior to Caught In The Middle. It’s always going to be a mystery why A1 weren’t able to consolidate that song. I can only assume that they were chasing a few different audiences without being able to latch on to any of them. The interesting thing is that the A1 story does not end there. There was a brief split during which time Ben Adams scored a modest solo hit and then they reformed as a three piece. While UK success eluded them; ironically as CITM anticipated Beautiful World era Take That by about five years; they had a top ten hit in Norway as recently as 2012. I’m sorry, but I still don’t really get the appeal of A1. Honesely, I can hear what everyone else is describing, it just doesn’t sound particularly coherent or memorable. And why has nobody mentioned the robot voice thing? I don’t like the robot voice thing. I’m with Weej on this one. Not getting it. It’s more interesting than most of the boyband stuff we’ve had, but still only a 5 for me. This is the first song on Popular since around the mid 1980s that I don’t know – there have been a few I’ve not known the title of but a quick youtube has got me right back. This is bang in my glory years as well – I was nearly 17 at the time and spent a lot of time listening to Radio 1 and watching The Box so I’ve no idea how it passed over me (I was in prime indie snob stage I suppose) as it’s pretty good for a boy band record, and really well produced compared to the tacky stuff you’d expect. A quick look at their discography shows Caught in the Middle as the only non-cover I could possibly hum, and that’s a great song as well. Speaking of boybands – is that new 3 advert with ‘It’s Alright’ by East 17 on it aimed squarely at my generation’s forehead or what? It’s perfect. A catchy tune from my early teens that I had totally forgotten about from a band with just enough kitschy appeal these days to remember with a degree of fondness. The first time I’ve been genuinely taken aback by an ad since that Cadbury’s gorilla one. Good chorus this. Rest of it is a bit tepid, but it tries its best to raise itself a little bit above the sum of its parts. Many, many worst songs have been discussed in the past few months. ‘Caught in the Middle’ is however, a wonderful, wonderful track reminiscent of Imbruglia’s ‘Torn’ which I (and I presume everyone else) loved, with more than a dash of ‘Last Christmas’ in the video. Why couldn’t they follow it up? Just listened to that twice in a row, and it was only just starting to pall. The sound’s at once instantly recognisable and formulaic as hell, but the singers do bring something to it – specifically, a nagging, whiny aggression which gives the song some edge. Not sure about the John Leyton comparison – what it reminds me of is East 17 – but it’s certainly streets ahead of the “Take on me” cover. 7ish. First impression was pretty negative. The production felt infuriatingly cheap, for one. A second listen, however, bought a more positive reaction, which sparked a third, and suddenly the song emerged as an unexpected pleasure. Highlights: That fake-out introduction, repeated in the style of the rest of the song as a middle eight; the chorus is not only a winning hook on its own, but for some reason the chord change into it seems to work brilliantly and I’ve no idea how; being cheap might well work for uptempo boyband vulnerability. Lowlights: But it really does sound cheap in places, certainly the beats, and the breakdown emphasises that cheapness and is painful timewasting on record that feels like it was created to allow for a dance break in the video. I don’t like the robo-vocoder either, although it is good silly fun to impersonate so I’ll give it that. Quirks: I’ve been musing about how most popular music for male voices sits awfully high, noted that my own high singing is basically confined to being either very loud or an erratic falsetto, and then had the bizarre thought that most male-sung pop has other forms of high-pitched singing without me being able to name a single example. This (and Caught In The Middle, which actually deserves the 8 this got) fits the bill! While playing this again as I wrote this, the next song that Spotify threw up on shuffle was “Lay Your Love On Me” by BWO. That’s a good bit more recent, and BWO aren’t a boy band, but it’s musically in much the same area of pop, and it does it a good bit better. 6/7 borderline for A1. I honestly believe the BSBs and real-Max would have turned this into an 8, but that’s making the unlikely assumption they didn’t do it as a ballad, and it wouldn’t be anywhere near an 8 in that form. #15 – I do indeed mean him – just looked up, my word, he really hasn’t! Two #2s, two #3s, that’s it! #17 I am pleased to say no #1’s on the Hot 100 either. Here the explanation is that few radio programmers would be caught dead playlisting a Bieber song (he has topped the downloads chart). Not sure how the UK chart has dodged this particular bullet though. This is my ‘Baby Jump’ of 2000 I think – I figured I might recognise it when we (eventually) got to the chorus, but nothing. It’s OK but just doesn’t sound like a number one to me – there’s just nothing distinctive about it. ‘Caught in the Middle’ though, which YT takes you to next, yes I remember that well. Was the ITV Chart Show still airing on Saturday morning when this was out? That would have been pretty much my only connection to the chart by this time. In early 2000 I got a job that involved working most Sunday afternoons, so no more Top 40, and by the time I was able to listen again, I really didn’t want to. The echoey chords at the start of the video for this remind me of something – possibly the surprisingly unbunnied Butterfly by Crazy Town? Anyway, Tom nails it here again – this is the bit where you have to say something out loud to realise you don’t believe it. Agree this sounds like an NSYNC knock off from that year. Re-reading through various entries, and the relief that a certain young Canadian had yet to be bunnied in Summer 2015 is making me chuckle. We knew not what was coming. I think he’s on seven now. 3 and 3 features – though at this point there was also a not-quite-so-young Canadian who’d had one week as a feature in 2010 and a tyranny of the charts to come.